It's always nice to get the crew together and have a little fun. 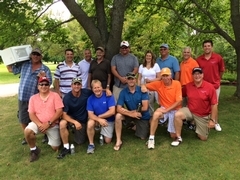 This picture is from our annual golf outing at Bay Ridge Golf Course in Sister Bay. Fun was had by all followed by prizes awarded and food and beverage at Husby's in Sister Bay.